The Nanny Network is an association dedicated to the support and education of professional nannies. 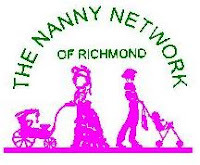 It is a non-profit organization made up of nannies in the Richmond , Virginia area. By joining our organization, you will become part of a network that will provide you with information pertinent to the nanny profession. You will also gain new friends with which to share ideas and spend time. Meetings are held on the second Friday of each month.Please call or email for the location. You are invited to participate as little or as much as you wish. There are many activities in which to take part. For you and your charges there are playgroups and holiday activities. For you, the nanny, there are Nanny Nights Out, meetings, parties, CPR classes, conferences, and plenty of other social activities and educational opportunities. Be a part of this wonderful group serving Richmond and the surrounding areas. No dues are required of members, and membership is very diverse in ages of the nannies.